GRASSROOTS is an ecumenical Christian programme of community engagement. The organisation strives to uncover a sharp edge of engagement with contemporary issues of community cohesion, peace and reconciliation, and injustice and inequality in Luton’s diverse context. In partnership with Luton Council of Faiths which is a charity promoting Peace through inter-faith and inter-cultural understanding we want to spell the peace building initiative and message in the most creative way especially to young audiences. 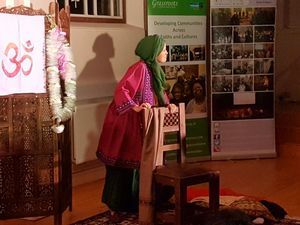 Because stories are powerful and have a lasting impact on people, using the ‘lost art’ of story-telling with local professional Award winning Khayaal Theatre, we are delivering storytelling performances consisting of character and virtue nourishing stories. 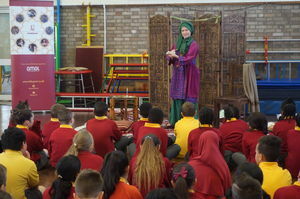 Tales are from a collection of four wisdom tales from the Hindu, Jewish, Christian and Muslim faiths traditions. The performances invite children to identify, articulate and reflect on the shared overarching humanitarian values and their currency in and relevance to their lives that the stories promote and celebrate. The stories are theatrically performed over 50 minutes followed by 10-15 minutes of conversation with options for extended engagement through games and exercises. This educational offering supports religious education, PSHE, citizenship, art & design and English strands of the KS2 national curriculum. We aim to showcase the activities proposed during Luton Town’s Annual Peace Walk 2018/19 (close to the international day of Peace in September), thus reaching many people from across different backgrounds. We also want to promote storytelling to the local schools and beyond working Khayaal Theatre as a resource in this field, which schools can tap into. We will do this directly with Schools but also through SACRE (Standing Advisory Council of Religious Education) that we work in partnership with. The Tales of Wonder project will seeks to reinforce human goodwill, human values which resonate with all faiths, communities, cultures or nations’ sets of values and virtues. It therefore has a mass appeal. People will experience it as mutually uplifting and appreciate its positive message for the common good. Art transcends many boundaries and therefore it can reach out and speak to the heart of people much more powerfully in a transformative way to all people, regardless of their faith or beliefs in an inclusive manner. The rich diversity within art is far more palatable and culturally relevant in the British context, rather than talking, discussing and debating issues, particularly when we are seeking to impact on the young people. We believe it will dispel many prejudices and address around religious coexistence. 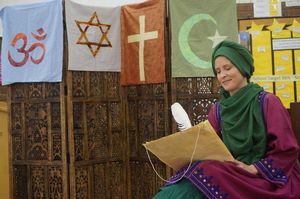 Moreover, the project aims to inspire children from minority backgrounds to discover and connect back with their respective positive faith and cultural heritage, which is not at odds with the British values, rather complements it. For more information check the Grassroots website.